Third part of the cyberpunk visual novel series Invisible Apartment. Kacey's story comes to an end. 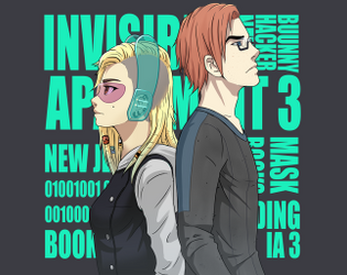 The Invisible Apartment cyberpunk visual novel series began in 2014 and has seen three parts of the series get to Steam, the iTunes app store and Itch. Kacey & Alex find themselves in a complicated situation. They're both on the run, Alex no longer works at the Central Intelligence and they don't know the whereabouts of Alex's mom who is detained in a sleeper cell. Hi! I'm sorry for bothering you, but I'd like to know if you plan to release this game on Steam, like you did with the previous games. hi Helena :) yes, absolutely. We just need to figure out some technicalities - for the last year we wanted to move to a system when you would download IA1 & then the other chapters as DLCs. We don't yet have all the bugs fixed to move to that. Over the last two years it became clear that it's too much of an overhead to release each chapter / part as a separate Steam game, so we began developing a system where each chapter would be a DLC. So, in short - yes, we're testing it. As soon as it's bug-free (hopefully October) we're releasing.